A 3-Day programme for young musicians and technicians. 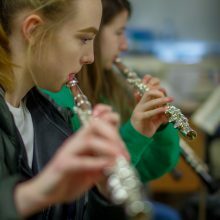 Girls Can… is aimed at young women aged 14 – 21 years with a passion for music who want to develop their skills, knowledge and experience by working alongside industry professionals. During the project there’s the opportunity to compose and produce a piece of original material, which will be performed at the Rude 2.0 gig at More Music on 23 February. There’s also the opportunity to take part in a masterclass with Annie Whitehead and Jennifer Maidman from Rude 2.0. Girls Can… is a project that aims to readdress the balance of women’s representation in the music industry and celebrate young women’s achievement. Presented by the Women in Music Network.